This Reef Fish Identification Book is an excellent guide for the Salt Water Aquarium Fish Colector. Monofilament fish collecting nets are ideal for collecting tropical fish because the monofilament is nearly invisible to the fish. It has far less drag than the plastic bag type net. 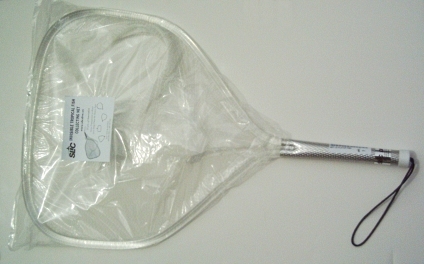 This net has a solid aluminum frame.The monofilament portion measures 14.5" wide by 22" long. Net measures 31" long overall. From Slic Dive. This large teardrop-shaped net is made of aclear lucite-like plastic frame nearly invisible to fish! 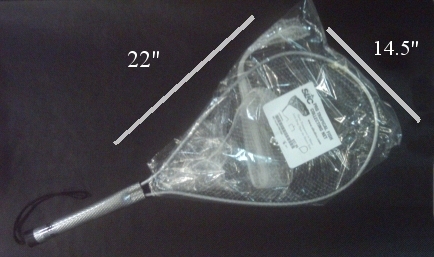 Net measures 28" long overall, with the monofilament net portion 15" wide by 18" long. Manufactured by Slic Dive. Fish Identification CD-ROM for Florida, Caribbean and Bahamas. This is the ultimate fish ID learning tool! Features a fish finder, where you can specify charicteristics such as color, markings, body shape, size, habitat, zone, depth and behavior. There is also a hyper book to learn all about the fish, with over 1600 images and audio, to hear the proper pronounciation of the scientific names. Other features include: virtual dive, sightings logbook, video clips, essays, anatomy an markings, learning games, help and information. Shell collecting bags available in two sizes, each with a drawstring top. 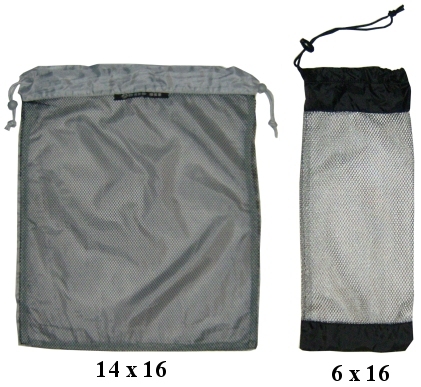 Large 14" W x 16" L has mesh front and nylon back for $6.95 Sold out! This large flat-top net is made of aclear lucite-like plastic frame nearly invisible to fish! Net measures 26" long overall, with the monofilament net portion 16" wide by 16" long. Manufactured by Slic Dive. Slurp Guns make collecting tropical fish easy. 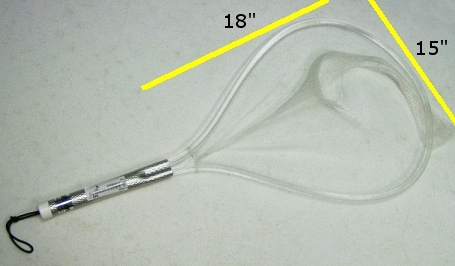 Mini (24" L), Master (36" L), Magnum (not shown; 30" L) slurpguns have 1.5" diameter front tube and 3" main tube, while the Trapper (30" L) slurp gun has just a 3" main tube for larger fish. Click here for slurp gun operating instructions. Don't forget a collecting bag for holding fish after capturing them! Small monofilament tropical fish collecting nets from Slic Dive have a lightweightaluminum frame. Monofilment mesh is about 1/4" square. This small teardrop-shaped net is made of aclear, lucite-like plastic frame that is less visible to fish! Net measures 24" long overall, with the monofilament net portion 10" wide by 13" long. Manufactured by Slicdive. Our tropical fish collection nets have vinyl sides and a mesh bottom, so they are nearly invisible to the fish! Great for large aquariums or collecting fish while diving. Three sizes of nets available. Don't forget a holding bag! 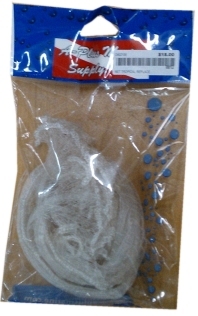 This monofilament collection net measures14" Wx 16" L (mesh portion). Small mesh that fish don't see until they're in the net. Transparent frame is virtually invisible, and constructed of a tubular plastic that is less brittle than many other clear frames. The safest way to collect lionfish! 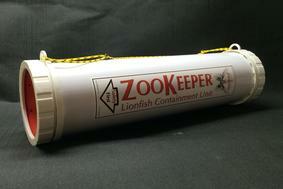 Zookeeper units are now the preferred containment unit of divers protecting the marine ecosystem, eliminating large numbers of lionfish. Made with UV resistant PVC and ABS plastics. Safety valve allows water displacement to occur at the rear of the unit, while preventing the spines from coming through.